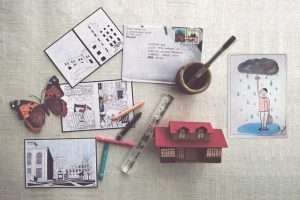 Sumedha Sah, a Mumbai-based architect and self-taught artist, is reviving the art of letter writing through her initiative The Snail Mail Project. When did you start The Snail Mail Project? 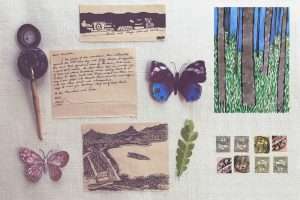 The Snail Mail project had been brewing inside my head for a few years and when I moved to Bombay two years ago, to work as an Architect and pursue my artist residency at IIT. I found the perfect time, place and opportunity to start it. What makes the project so interesting? The project is fairly simple and straightforward; I invite anyone to send me a something by post. It could be anything from a handwritten letter, a poem, a photograph, a broken leaf, a cut out or even a page from your diary. It can be about the thoughts that cloud your mind, your ideas about the world, a movie you like or a travel experience. It is a one-time exchange and in return, I send an original handmade artwork, inspired by your letter. What was the idea that kick started this project? The project came to be as a response to many things. The first was my moving to Bombay, I am from Nainital and for the first time in my life I found myself in a big, chaotic metropolis. It was a way to connect with people for me. 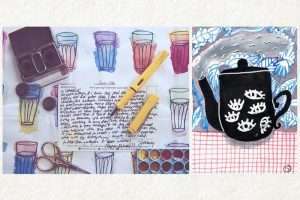 The second is the love for letter writing that I always had, as a little girl I loved to write letters to my father and the third was my love for art. In fact, the project is simply the amalgamation of all that I adore. Were you a regular letter writer even before you started the project? few and far between with the onset of mobile phones and emails. I did miss the meaningful exchange of a handwritten letter. However, I have been sending out handmade New Year greetings to my friends and family for about 5 years now. How has life changed after the project grew manifold? I certainly make more visits to the post office and the neighborhood letterbox and you will find me often waiting for the postman to arrive. As an artist, the project has certainly made a difference in my painting style; I am now more experimental and confident in my work. How much importance does a handwritten letter holds in this digital world? There is something deeply humane about putting pen to paper. Letters and postcards remain to be read, appreciated and preserved years after they have been written. Electronic age may be faster but a charm of a letter in your postbox can never be compared to receiving an email. 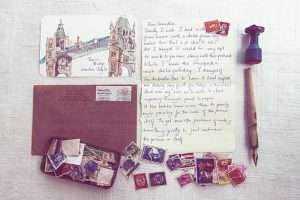 A handwritten letter is immensely powerful; its value lies not only in its permanence but also in the fact that it helps us connect with our minds. Letter writing is personal and requires our undivided attention, it forces us to live in the present moment and contemplate our thoughts and ideas without other distractions. What do you think makes The Snail Mail Project a successful one, in a short span of time? Its popularity lies in its fundamental idea. The idea of exchange, connect and co create. All of us, busy bodies are looking for a way to slow down and connect with our world and ourselves. 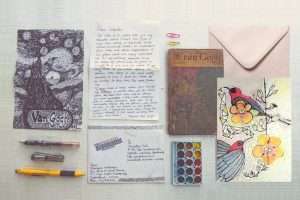 The Snail Mail project enables one to take a breath, sit down in solitude, reflect and create. Another thing that resonates with people is its undefined nature; it is for anyone who wishes to send in a post. A post, which could contain anything, you want to send. It could be a photograph, pressed flower, broken leaf, a poem, a newspaper cutting or a few heartfelt words. It could be whatever one thinks is worth sharing with the world. Apart from this there is no denying that, writing and receiving letters is a joy in itself. Which has been the interesting letters that you have come across? Please share some interesting stories people have shared with you. Every letter is unique in its own way, people write to me about different things, some write to me about personal stories, their aspirations and things they love to do. While others send in their poems,travel talesand illustrations. I have even received a mail from Scotland with a precious recipe for a chocolate brownie inside it, which I am yet to try. One of my favorite letters was from a student of University of Chicago who was working with sanitation management and waste in the slums of Bombay. She wrote to me about how everyday she has to go to the field and get down and dirty working with waste on the job and the only thing that made her happy was a little cup of chai after work. This was such a heart touching letter for me as I think it was so beautiful she found so much meaning in such an ordinary thing and the same emotion is so resonant with millions in our country. To me a foreign national, recognizing the love we have for chai and discovering it for herself was just beautiful! I have received about 40 letters from places as far as Poland, Scotland, Japan, Turkey, U.S.A, U.K, Singapore and of course from many parts of India as well. You are also an artist, are you working on any art works? I am working on a series of paintings called ‘Melancholy’. Melancholy is particular species of sadness, which is apart of being human. It means grasping without anger the fact that life is inherently difficult. Melancholy makes us aware, compassionate and forgiving. Although we spend a lot of time in being happy, we must look at melancholy from time to time and accept it. Sometimes it’s okay not to be happy. Inspiration for this series of portraits lies everywhere you look. It lies in the common people; it lies in our society and us. The medium is a mix of watercolor and acrylics. How long do you plan to continue The Snail Mail Project and what more do you want to do with it? This project has no deadline, no end date. I don’t mean to stop this ever. I wish to keep receiving beautiful letters from all corners of the world and perhaps make an exhibition when I have a good collection.